It’s OK to Be Gay, But Should We Really Say That We Were Born That Way? I have never hesitated to use the “born this way” argument to talk about gay rights. As a gay person, I have always maintained that my sexuality is an innate characteristic that cannot be changed. 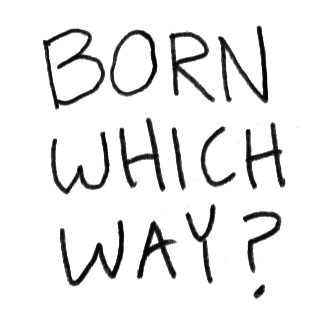 I never thought there was any harm in telling people that I was born this way. After all, it sure as heck beats “I did indeed choose to be gay, now leave me alone.” I’m beginning to think there may be a middle ground. But if so, it’s a difficult place to stand. In direct opposition to both the mainstream gay movement and Lady Gaga, I would like to state for the record that I was not born this way. I have dated both men and women in the past, and when I’ve been with men, I never had to lie back and think of Megan Fox. I still notice attractive men on the street and on television. If I were terrified of the stigma associated with homosexuality, it would have been easy enough to date men exclusively and stay in the closet my whole life. Obviously, no one sits down and makes a rational decision about who to fall in love with, but I get frustrated with the veiled condescension of straight people who believe that queers “can’t help it,” and thus should be treated with tolerance and pity. To say “I was born this way” is to apologize for the person I am and for whom I love. It’s like saying I would be different if I could. I wouldn’t. In order to understand the importance of Miller’s argument, you’ll need a quick and dirty (sorry) introduction to human sexuality in political arguments. In general, there are two ways of talking about categories of human sexuality: essentialism and social constructivism. You’re probably accustomed to the essentialist point of view because it’s what you typically hear from gay rights activists: sexual orientation is a real, coherent category of human difference and not a choice. Essentialism has all sorts of rhetorical and political advantages. It lets one argue that gay people cannot be “changed” or “cured.” Essentialism supports the idea that homosexuality is a natural human variation that ought to be respected and treated as neutral from a moral and legal perspective. An essentialist approach to homosexuality also makes sense given the persecution of gay people—why would anyone choose to be something that is so often despised? Social constructionism, on the other hand, is more complex. A social constructionist approach to homosexuality holds that categories like “homosexual” and “heterosexual” are created and that a persistent, definable sexual orientation is a grand and sometimes strategic fiction created by society and thereby forced upon us all. This understanding of homosexuality is embraced by many academics, especially in the humanities. Miller rejects essentialism, but she doesn’t quite embrace social constructionism, either. She isn’t arguing that homosexuality is an invented or constructed category; she merely defends its validity as a way of being. Miller’s argument is neither essentialist nor constructionist and that makes an intriguing—but tricky—middle ground. She’s not really saying that homosexuality is a choice. But neither does she claim it as an unavoidable reality (i.e., something one is “born with”). Her claim depends in large part on her bisexuality. The idea that she could have been with a man is only valid if she likes men in… that way. I’m wondering if Miller’s argument is a desirable middle ground and if it is at all accessible to people who aren’t bisexual. I’m with her in that I’m not particularly fond of the born-this-way argument. I like her position because it accounts for the fact that I don’t actually remember being born and so can’t make any claims about my own nascent sexual orientation. But in an argument—especially a public argument—we must often simplify our identities so that others can understand them. The truth, in all its complexity, doesn’t always work in a highly charged political debate about rights. The question, then, is sort of a big one: should marginalized people try to tell the world the truth about themselves in all its complexity? Should gay people, for example, take pains to explain that some of us are bisexual and do choose homosexuality over heterosexuality? Or, is it OK to simplify our narratives into a more politically viable we-had-no-choice narrative? And, more importantly, I wonder if I could really dance to a Lady Gaga song with a chorus like, “I’m not sure if I was born this way or not but it doesn’t matter because choice is irrelevant to civil rights and I’d sure like some. Thank you.” It just isn’t danceable, you know? You can usually expect any explanation of social constructionism to mention Michel Foucault. His book, The History of Sexuality: An Introduction, is a nice entry point to this way of thinking about human sexuality. Another note on the essentialist argument: it also allows one to reach back in history and claim that someone like Abraham Lincoln could have been gay because, well, at least some historical persons must have been, right? In case you’re wondering how I talk about choice in relation to my own sexuality, I usually say some variation of the following: “Being gay has been the source of tremendous difficulty and hardship for me, but it has also been the making of me as a human, a man, a son, a brother, a teacher and a citizen. However much I might want to say that it is just one characteristic among many, my identity as a gay person has defined my life in ways too numerous and fundamental to imagine away, much less want to change. I would not be the same person.” God I love making that speech. The next time you see me, please please please ask me a question that I can answer with that speech. I agree, Doug, complexity doesn’t lend itself bumper stickers and a new conceptualization probably needs a name. As you seem to suggest, essentialism seems to go too far (in order to pose a needed, unassailable counter argument–needed at least in response to current public understanding ). But a social construction interpretation seems to duck the genuine social issue and the reality of a felt individual personal identity. Moreover, wouldn’t a rhetorical model of leadership call us to draw our publics to recognize the conflict located in differing assumptions & interpretations, to keep our feet to the fire, to deliberate and learn–in the hope of reconceptualizing the issue? Even if it is complex? Why do we have to buy into the binary in order to advocate for civil rights? Could we sidestep this issue altogether? Most of the opposition to lgbt rights comes from religious people, and that is a supremely chosen identity. How would it go if we suggested it’s fine to discriminate against christians because after all if they don’t want to be discriminated against they can always change their religion? Choice should have nothing to do with civil rights. More than as a political strategy, I do find the discussion interesting as a way of understanding myself. At least 3 things get conflated when we talk about sexuality—attraction, behavior, and identity. Of the 3, attraction is the one that is not really changeable. I don’t decide who I am going to find attractive. I do make decisions, and perform them publicly, about my sexual and social habits and other facets of my identity. Is it really that complex to keep them straight?